With their grassroots approach to rock and roll, the Woggles are a refreshing change from "rock star attitude" bands. No illusions of grandeur and rock stardom here. These down-to-earth rockers are on a mission. With the fervency of a revival preacher, "the Professor" drives home the band's very own version of hook-laden, garage rock and roll gospel to the unsaved masses everywhere. Their previous full-length albums, both on Estrus Records, were actually collections of the band's single releases. "Teen Dance Party" (1993) and "The Zontar Sessions" (1994), perfectly recreate their powerhouse live shows. QUESTION: What's the title of the new record? Manfred: It's called "Get Tough". I fell off swinging on the rafters down in Pensacola, the pole came out of the ceiling - it was not supposed to happen like that. I did finish the show however & I went and saw an orthopedic doctor and he said, "Mr. Jones, you're one tough nut." And I had to say, "you know doc, you've got to get tough!" He had no idea what I was talking about, of course. QUESTION: Was "Get Tough" recorded pretty much the same way as your previous albums? Manfred: "Teen Dance Party" wasn't recorded the way that we would have liked to have done it - we didn't get to give "our children" as much loving as we would liked to. We had to drive to the other side of the country, had like 2 days to get everything done in. Basically, it was show up, run through all the songs and then it was over. QUESTION: On your previous albums, the songwriting was split between members of the band, is that the case this go around? Manfred: Dan, the drummer on the new record, has four. He writes the songs on guitar and then shows the guitar player what he wanted. And (laughs), he's gonna get what the guitar player actually plays! Then there's myself and the guitar player, Zorko (ex-guitarist, Martin Broocks). He and I co-wrote most of the other songs. Patrick and I did one song together. Then he, I and Martin did two others. So, yeah, it's pretty equal in fact there's one song that Jeff Walls (the producer) wanted to contribute a part to. QUESTION: Is there a new approach on "Get Tough"? Manfred: I think what were doing is taking the approach that we had when we were doing the singles and try to apply that to a full length record. Everyone was pretty much playing live. There was an occasional guitar solo overdub, but some of the solos were played live as well. But, especially compared to the other time we were wanting to do a full-length record-I'm much, much happier with this. The other aspect is, I'm not a fan of a concept album, or rock opera. On the record there's an instrumental, a folk-rock song, faster songs...there'' not actually an outright ballad. What I do believe in, is songwriting and trying to write songs that contain the elements that make for great rock and roll songs. That's really what the focus is. QUESTION: What is your view of the current music scene? QUESTION: Was there any leftover material from the sessions? Manfred: There were a couple of cover songs that weren't on the record that we're gonna release as a split single with Hillbilly Frankenstein. Manfred: When the band first started, we were all in school at the time, and most of us worked at the student radio station. We were enjoying all this music, and there was like nobody playing all this stuff. So, we thought, "well, we ought to do that & " and formed the band then. 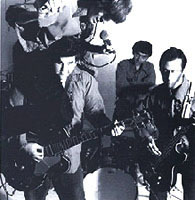 The band played its first show Halloween of 1987. January of '88 was the first time we played a club. We've played all over the U.S., everywhere in the South. We had played in Japan, not last year, but the year before. Originally, the band had two guitars. Patrick joined in 1995. Dan came in the fall of 1995. QUESTION: What is the tour agenda for the promotion of "Get Tough"? Manfred: In April, beginning the 3rd, we tour all the southeast, then the end of April we fly to Japan, come back from that and do shows in the NorthEast through June, then the Midwest. Then after the 4th of July we'll do the West Coast and come back.